They also would prefer plans to drive down electricity costs rather than new tollways that drive up the cost-of-living; and new train lines that can’t connect them to services like mental health support if those services don’t exist. 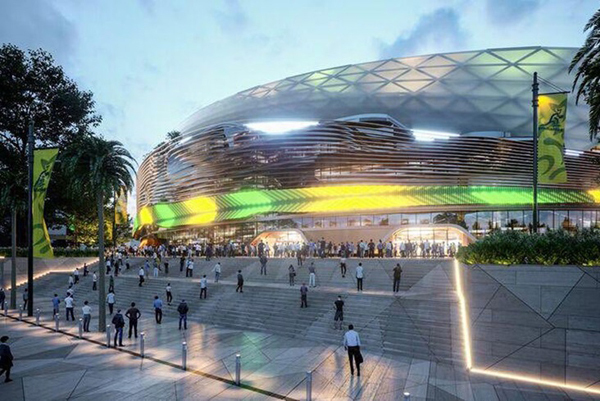 An artist's impression of the proposed Allianz redevelopment. As the contested demolition of sports stadiums in NSW gains increased numbers of headlines, 18 community organisations have announced they will campaign to ask all political parties ahead of the NSW election to prioritise building great communities for a fairer NSW. “NSW is a rich state in a rich country, and there is no excuse for people here being left behind,” said NCOSS CEO, Joanna Quilty. Homelessness has increased by 37 percent since the 2011 census and we’re seeing greater unmet need for essential supports and services such as community-based mental health services and tenancy advocacy services. In recent years we have also seen dramatic increases in the number of people with mental health issues presenting at emergency departments and homelessness services. Dana Clarke, the Chair of Absec, said dramatic improvements are needed for not just Aboriginal people, but all disadvantaged sectors of the community, including in the regions. “Strong, resilient communities are built on more than infrastructure in urban areas, they are built on equality and respect for all. Inequality in Australia is on the rise, and as the gap widens, Aboriginal people are affected the most.” Dana said. “These divisions, if ignored, will only cause further harm to society. I am here to tell you that Aboriginal people need a change. “The solutions lie in Aboriginal communities themselves. We know that outcomes for Aboriginal children and families are greatest when Aboriginal people develop and drive the solutions. Karen Walsh, the Chief Executive Officer of Shelter NSW, said, “With 60,000 households on the NSW Social Housing Register, one in two low income renters experiencing rental stress and the number of people living in overcrowding increasing by 74 percent, its evident that we need urgent action from government. “We need a 20-year housing strategy that includes funding to build at least 5,000 social housing homes every year, mandated targets to deliver social and affordable homes in new residential developments, and for 100 percent of social and affordable housing to be accessible for people with disabilities. “We also need better policy settings and legislative reform so that we can provide people with assistance to prevent them becoming homeless,” Karen said. The Building Great Communities campaign is supported by NCOSS, Fams, Homelessness NSW, AbSec, Yfoundations, Association of Children’s Welfare Agencies, Domestic Violence NSW, Community Housing Industry Association NSW, Community Legal Centres NSW, Shelter NSW, People with Disabilities Australia, The Centre for Volunteering, Financial Inclusion Network, Youth Action, Tenants Union of NSW, Local Community Services Association, CREATE and Churches Housing.